A.G. Rhodes is one of Atlanta’s oldest nonprofits and most trusted leaders in senior care. We offer competitive salaries and great benefits, and have an outstanding reputation in the health care community. 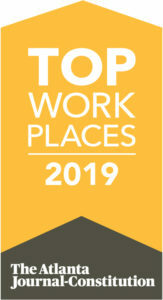 Ranked as one of The Atlanta Journal-Constitution‘s top places to work in Atlanta, we believe that our employees are our greatest asset. 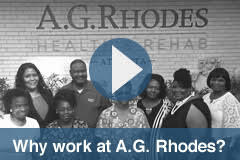 At A.G. Rhodes Health & Rehab, we believe that our employees are our greatest asset. To ensure we attract and retain high-quality talent, we strive to maintain competitive salary and benefit packages for our employees, and reward outstanding job performance. Employees must complete the 90-day introductory period before becoming eligible for most benefits. Paid time off starts to accumulate on the first day of employment, but cannot be used until after the 90-day introductory period. Each employee receives an employee handbook and other detailed information about our benefits packages, and below is a brief overview about a few of the benefits we offer. Our medical plans provide insurance needed to protect our employees and their families. We make available medical insurance for employees working 30 or more hours per week. The company pays part of the cost of an employee’s individual insurance. Family insurance is also available and paid in part by the company. Dental and vision insurance are available for employees working 30 or more hours per week. The plan premiums are paid solely by the employee and are payroll deducted. We offer potential tax savings to employees with the option to participate in FSAs. Both Healthcare and Dependent Care FSAs are available for employees working 30 or more hours per week after one year of employment. The contributions are paid solely by the employee and are payroll deducted on a pre-tax basis. An HSA is tax-exempt savings account that can be used to pay for certain medical expenses. An HSA is only available for employees who are enrolled in a high-deductible health plan. The contributions you make to an HSA are not taxed, nor are withdrawals for qualified health care expenses. Also, A.G. Rhodes contributes to employees’ HSAs to help with health care expenses. A.G. Rhodes provides and funds a six-year vesting retirement plan. Employees who are 21 years of age and have completed one year of service during which they worked a minimum of 1,000 hours are eligible to enter the retirement plan. Basic amounts of life insurance, AD&D and short-term disability insurance are provided for employees after one year of service and who are working 30 or more hours per week. The premiums for these coverages are paid entirely by A.G. Rhodes. We also provide an opportunity for employees to have additional life insurance on themselves and families under a voluntary program. These premiums are paid solely by the employee, and are payroll deducted. Paid Time Off (PTO) accrues upon your first day of employment and is subject to a maximum accrual of 144 hours. The PTO accrual rate is based on an employee’s paid working hours and years of service. Regular, full-time employees enjoy nine paid holidays including New Year’s Day, Martin Luther King Jr’s Birthday, Easter, Memorial Day, Independence Day, Labor Day, Thanksgiving Day, Christmas Day and your birthday. Part-time employees will receive only the birthday holiday each year, and must be continuously employed for a period of three months prior to their birthday. We provide periodic in-house training programs for qualified employees. In addition, regular full-time employees may be considered to attend training programs that enable them to improve their job proficiency or that are beneficial to the company. Financial assistance for tuition, books and supplies for such training programs may be provided. We offer two scholarship opportunities for employees: The Nursing Education Scholarship which is open to full-time A.G. Rhodes employees pursuing LPN, RN or RN-BS programs; and the High School Graduate Scholarship open to the child or grandchild of a full-time A.G. Rhodes employee. Learn more about the eligibility requirements and how to apply.